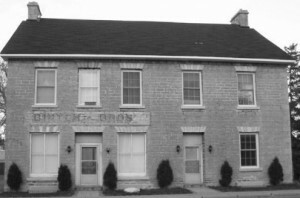 This building is the last remnant of the commercial successes of the esteemed Lyon family which dominated not only village life, but also the politics of Carleton County and Ottawa through much of the early nineteenth century. William R.R. Lyon who owned this building was the son of Captain George Lyon of the 99th/100th regiment – the major merchant and mill owner in the village and his wife Catherine Lyon. A store was operated at this location for almost 150 years. William R.R. Lyon, said to be the first male child born in Richmond, in 1820, bought the property now called 3559 McBean St. in August 1843. His father, Captain Lyon, was a well established merchant and the 23 year old William was continuing the family business. An original ledger book for the period 1844-1846 shows that he ran a very active store with some 6,800 entries in the Day Book for this time period. In the near future we will post an index to this ledger book with links to the entries. William was Reeve of Richmond from its incorporation in 1850 until his death in 1854. The 1851 census records that he lived in the building with his wife, 4 children, 3 servants, and 2 clerks. The work of Ms. Down references W.H. Smith’s Canada, Past , Present & Future published in 1852, where Mr. Lyon is listed as merchant, postmaster and potash manufacturer. In 1856, William Lyon’s widow, Henrietta, a daughter of Captain John B. Lewis married Rev. John Strutt Lauder. Rev. Lauder was rector of Christ Church ( later Cathedral) in Ottawa for 43 years and retired as Dean of the Cathedral and Chaplain to the Senate of Canada. Mrs. Lauder had 3 more sons in her second marriage. She seems to have been wealthy by Richmond standards. Records show she donated $200 to the building fund of St. John’s Church in 1860 and owned several properties in the village in 1863. Although the building continued to be owned by the Lyon family until 1915, the degree to which the family store continued is not clear. Thomas V. Lyon was only seven when his father died, however, in the 1871 census Thomas is listed as merchant and in 1891 as a bookkeeper. Also in 1891 Thomas’s son, Frederick Lyon, age 19, is recorded as being a “clerk, general store”. Whether this is the Lyon store is not known. From 1901 until 1924, brothers William and Robert Birtch operated a store in this building and from 1905-1912, Robert Birtch was also the Postmaster. The Birtch brothers were the fifth and sixth sons of the eight boys in the family of Thomas Birtch, an original settler and industrious businessman who owned 336 acres of land in 1844. As such, he was able to help his sons establish themselves. As well Mrs. Isabella McCord, a sister of the Birtch brothers, had a millinery store at this location before moving her business further north on McBean St. 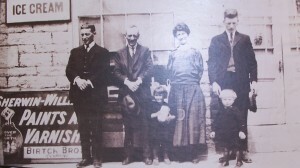 The Birtch family owned the building until 1935. On June 5, 1924 the Carp Review reported that Mr. Gordon Danby had bought the stock from the Birtch Bros. and was open for business. From 1941 to 1947 the building was owned by Thomas Touchette who added an ice cream shop to the side of the building. It quickly became a village gathering place. Mr. George A. Brown operated a small restaurant here before purchasing the stock of Brown Brothers Store across McBean St. from his father Robert E. Brown. From 1951 until 1963, Mr. & Mrs. Leslie Ralph rented the building and ran a restaurant on the ground floor while they rented the above rooms to boarders. They purchased the building in 1963 after which it was converted to apartments and, in 2012, is still owned by the Ralph family. This building, a vernacular interpretation of the Georgian Style, is a typical small commercial building of the period 1820-1850. Constructed of quarried stone, its basement walls are 28″ thick and the floors are constructed of 3″ oak planks held together by oak pins and grooved corners. One can still see stone quoins in the corners and radiating voussoirs above each of the main openings. The building is clearly divided. The 3 bays on the left were the store. The door is centered with a window in each side and 3 windows above. The living quarters were on the right. The 2 bays contain a door and window with a window above each opening. Down,Jane L. “The Richmond Day Book” Ottawa Branch News. Ottawa: Ottawa Branch Ontario Genealogical Society, vol.34, no.5, Sept-Oct. 2001. Goulbourn Township Historical Society Files. Illustrated Historical Atlas of the County of Carleton including Ottawa 1879. H. Belden & Company. reprint Oshawa On: Wilson’s Publishing Co., 1997. Interview with Robert Brown son of George A. Brown and grandson of Robert E. Brown, April 21, 2009. McTavish, James H.A. Our Lyon Family. Kingston:2000. This entry was posted in Locations and tagged commercial, House, post office, store. Bookmark the permalink. I am descended from Robert Birtch by Adam John. He had a son Ruggles of whom I am descended by Louisa Adelaide, her son Everad and my mother Mildred Claire. I understood from other relations that Adam John and William ran the store. Robert I was told was a bit of a common criminal and did a stint for theft. Adam John was also a corporal in the 43rd and was the constable for Richmond.